Hello, my fellow human beings. My fellow humans, being. As we kick off #AlignmentApril, I wanted to share a little about yoga anatomy as it relates to Cystic Fibrosis, the what and the why of this coming month. Sometimes we’re so focused on Cystic Fibrosis, we forget that we have regular human bodies just like everyone else has. Mundane things like headaches, routine aches and pains often get ignored while we deal with the overwhelming “big stuff” like our respiratory health. When I started doing yoga in 2010 at age 30, I began to see how caring for my whole body could help improve not only my CF symptoms, but my overall quality of life. When I started my yoga teacher training a couple of years later, I relished learning about the way my body worked. I loved understanding it from the inside out, in a context that wasn’t all about CF. After I had a few years experience teaching the general public out in the real world, I realized just how much an understanding of universal truths about our human bodies could help all of us in our fight against Cystic Fibrosis. That’s when I first started creating yoga videos specifically for people with CF, and began thinking about creating CF Yogi. Alignment April is an opportunity to look at our bodies in a holistic way. Understanding the inner workings of our bodies. And learning how to apply these universal facts about the human anatomy to deepen our yoga practice . . . and our ability to care for our own bodies. On Saturday mornings in April, we’re holding a series of alignment-oriented yoga classes. Each week we’ll look at a different part of the body, and do a pose breakdown of what’s really happening. Which joints we’re using, which muscles we’re activating or releasing. By making each pose more effective, you’re maximizing the benefits of pose . . . and your time on your mat. Of course, yoga is all about being “in the moment,” and chit-chatty explanations during a yoga class can take you out of that blissful state of mind. 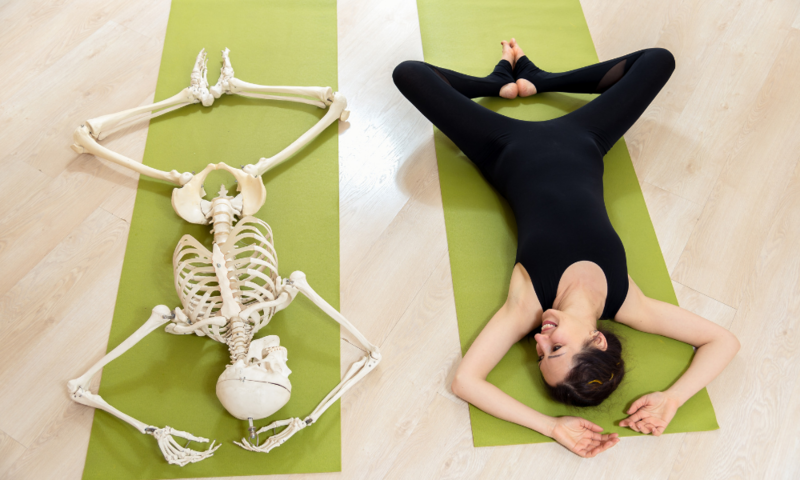 So to balance the “being” and the “doing” of yoga, we’re hosting our first ever Anatomy Deep Dive. What is the Anatomy Deep Dive? This will be a fun and interactive event! Do you want to know why we do what we do in a yoga class? This is an opportunity to talk about those deeper anatomical concepts. We’ll talk about some of the key bones and muscles of yoga. And we’ll explore the relationship between stability and mobility in our joints. We will apply some universal anatomy principles to discover how the same pose will look different in every body! Plus, we’ll be supplementing our virtual classes this month with some “Alignment 101” blog posts about the ways that certain joints and muscles work together. Stay tuned for the first in the series, to pair with the theme of our first Alignment-Oriented yoga class . . . Your Spine is Your Lifeline! Are you registered yet for our free yoga classes for the Cystic Fibrosis community? If not, sign up here!